Bigger brighter backlight makes it easy to read any time of the day. 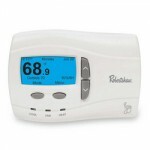 A fully adjustable temperature differential provides increased comfort control. The front load battery door makes it simple to replace the batteries. 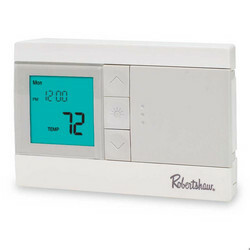 All RS2000 thermostats are fully compatible with all standard 24V AC heating and cooling systems. 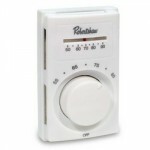 Mechanical Heat Backup This thermostat includes a bimetal switch that will automatically turn on the Heat when the temperature reaches about 41ºF (5ºC). WARNING: This switch only activates the heating terminal (W). The system itself must be capable of automatically turning the fan on. Without normal fan operation, severe damage to the heating system could result. Adjustable differential – thermostat is set at the factory to cycle at 2ºF (1ºC) above and below the set temperature (DIFF = 2). 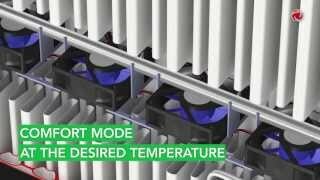 This setting has been designed to provide a comfortable room temperature under most conditions. However, if you find your system cycling too fast or too slow, then the DIFF can be adjusted to modify the cycle time.